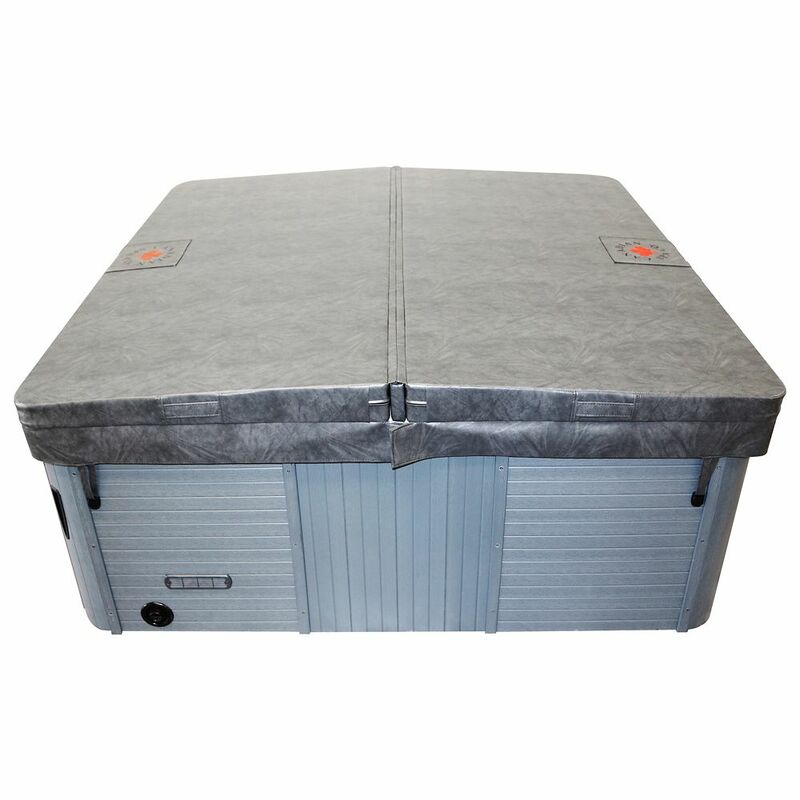 88-inch x 80-inch Rectangular Hot Tub Cover with 5-inch/3-inch Taper in Charcoal Grey Canadian Spa Company hot tub and spa covers provide unbeatable quality at an affordable price. Our covers are made from the strongest marine grade vinyl in the industry to withstand the harsh winter months and are both UV and mildew resistant. 6 re-enforced handles are built in at convenient points for carrying your spa cover and for simple cover removal. Adding to this support are 8 locking straps which fasten to the corners of the tub which are ideal for locations with lots of wind. The extra-thick 5 in/3 in insulating foam inside the cover is vacuum sealed with a 6 mil double coated polyethylene vapour barrier to increase the longevity of the cover and retain water temperature within the spa. For additional support, a metal C channel is added at the centre of each foam insert. Our cover includes an extra thick full-length steam seal inside the fold to trap any excess heat that would escape through the side of the cover and minimize heat loss. 88-inch x 80-inch Rectangular Hot Tub Cover with 5-inch/3-inch Taper in Charcoal Grey is rated 5.0 out of 5 by 3. Rated 5 out of 5 by Kim from We are very pleased with our purchase! The quality... We are very pleased with our purchase! The quality is excellent and the shipping time was great. Rated 5 out of 5 by Cemb24 from Perfect fit We purchased this cover a few months ago and have recently installed it due to the cold Canadian Winter! It turned out to be a perfect fit for our tub. We like the length of the side flaps and feel it is insulating well. It's also not heavy to fold up when we want to use the tub. Overall, we're very happy with the purchase. Rated 5 out of 5 by Kp89 from Excellent produxt We purchased this cover as a replacement to our original cover. It is worth every penny. Shipping was done in a reasonable time as well.